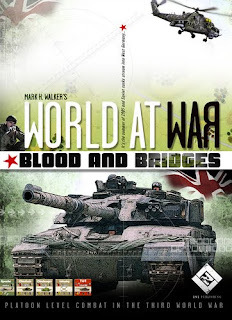 Blood and Bridges is a complete stand-alone module in the World at War environment. It is basically a wargame with a fictional topic - NATO forces have to defend bridges in the Rhine River Valley against attacks by Soviet troups. The box comes with a huge map, a lot of counters, a pretty (and most of the time rather clear) full-color-rulebook and player aid charts. There are 12 scenarios included, which should ensure varied games. 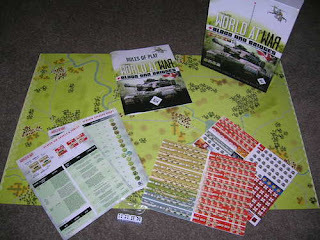 The basic gameplay is not too complicated, especially if you are familiar with basic elements of war games in general. In opposite to most other games though, the activation order of units is decided by drawing markers. Each unit has different values for certain abilities (moving, attack, defense, amor,...) which shape the gameplay. Attacks are resolved straight-forward by rolling dice (including some modifiers). Headquarters are use to simulate the topic "supply", which is an elegant solution and adds another strategic element to the game. It's not too complicated to get into the game, although not everything was quite clear at the beginning to me. Nevertheless the game plays fast, is exciting and doesn't take too much time to play (which at least for me increases the chance it hits the table more often). If you don't insist on a realistic simulation (which often comes along with a more complex and time-consuming gameplay), you should give Blood and Bridges a try - there's a pretty good chance you will like it. The war is raging on and now it is up to the British and their formidable array of weapons systems to blunt the Soviet spearhead. Chieftain and Challenger tanks, Striker ATGM vehicles, FV-432 APCs, Lynx attack helicopters, Tornado fighter-bombers and others clash headlong with top-of-the-line Soviet Guards units outfitted with T-80 and T-64 tanks, BMP-2 APCs, MTU-55 Bridge layers, SA-13s, Hind E attack helicopters, Su-25 ground attack aircraft and many more. There is only one mission here. Hold the bridges or see Soviet armor on Channel coast. Are you up to the task? World at War: Blood and Bridges is the latest complete game in the World at War series. It features 352 counters (we just added an extra half sheet of admin counter goodness), a mounted 22” x 34” map, 12 scenarios, two player-aid cards, dice, and a complete rules set.